Leaf and Point Trio/ Pattern plus Yarn/ Paint Your Knits! Sugared Violets/ Shawl Pattern by Rose Beck/ Plus Beads! 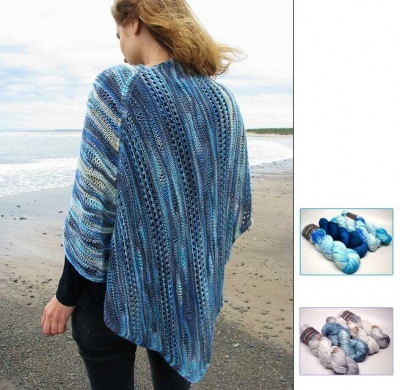 Harmonia's Rings Sleeved Sweater/ Pattern by Sivia/ Beads Too! Knitted Scarf Murano II/ One More Colorway! Bead Soup Bracelet/ Can Spring Be Far Behind? New Fangled Flower Bangle/ Take 2! EarthBound Misfit: New Club Offering! Fringe With Benefits: Back In Stock! Gathering Autumn's Splendor -- Pre-Orders Open! Gathering Autumn's Splendor -- Yet Again! Great Kits With Yarn From The Unique Sheep: In Stock! In Stock Kits With TUS Yarns! La Belle Et La Bete: New MKAL! New MKAL With The Unique Sheep! New Shawl: Isn't It Romatic? One Week In Iceland! Special Code For Free Shipping! T'is The Season Of Sales! Winnie The Pooh Mystery KAL! Wonder Bags Back In Lace Weight! Please contact us if you experience any problems finding what you need.